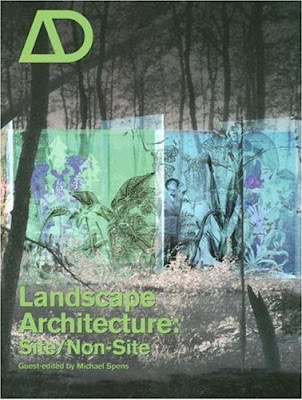 This fusion of magazine sized pamphlet/paperback book from Architecutural Design is entitled 'Landscape Architecture: Site/Non-Site' (Wiley, May 2007), and is a really quality investigation into some of the very themes in which I hold dear. I loaned this out and had not had an opportunity to delve into it until now and I was pleased enough to zoom through it in record time. The fact that it is well-illustrated and brief helped. Edited (as well as significantly authored) by Michael Spens, the topics range widely, with a good breadth of subject matter. 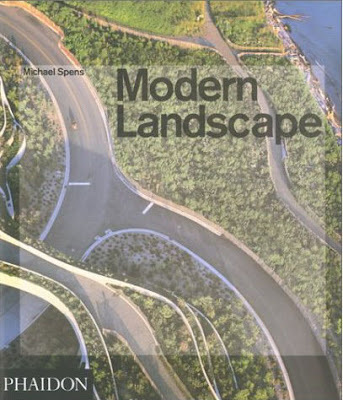 The content was varied with inclusion of that rarity - actual landscape architects from across the globe featured together - including an interesting review of Bernard Lassus (p.60), and a continent-spanning profile of the work of Gustafson/Porter (p.66). "The new architecture celebrates the fold-over of contrived surface with grasped surface. The new sensibility is toward terrain rather than patches or pockets. There is even a search for peace without escape - difficult for one to imagine amongst the chatter of the old city. 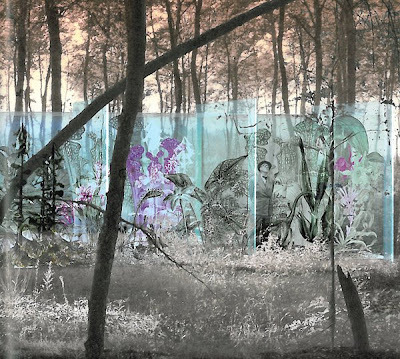 ...For me it becomes even more intriguing if we pull the vegetal towards the artificial and the fertile towards the urban but in the end ...to find the magic of a place discovered, now that's architecture." 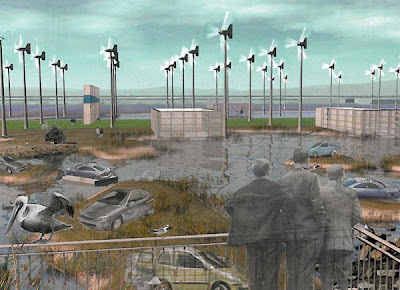 (From Spellman (ed), Re-Envisioning Landscape/Architecture, 2003). It's pure Landscape Urbanism from the core - specifically leaning towards vegetated architecture and landscape as form generator. This is even magnifed by a more experimental and expressive graphic technique that is refreshing (imagine what he could've done with some digital tools at his disposal). While I'm focussing on some visuals here for the most part, the overall scholarship is notable as well. One article in particular struck me as a wonderful companion to Cook's vegitecture leanings - and elucidated the Landscape Urbanism mantra of space forming capacity of landscape. 'New Architectural Horizons' by Juhani Pallasmaa (p.17) offers an essay about how: "...the over-intellectualisation of architecture has detached it 'from its experiential, embodied and emotive ground." A choice quote related to this is found on p.22, in a section titled 'Synthetic Landscape': "The architecture profession at large might do better if we began to think of our buildings as microcosms and synthetic landscapes instead of seeing them as aestheticised objects. Architecture in our time has been concerned with landscape merely as a formal and visual counterpoint, or a sounding board for architectural forms. Today, however, buildings are increasingly beginning to be understood as processes that unavoidably go through phases of functional, technical and cultural change as well as processes of wear and deterioration. 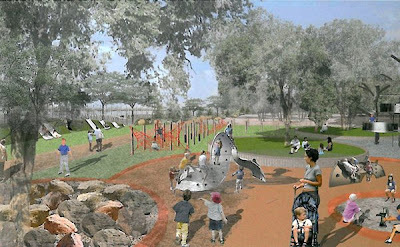 The fundamentally time-bound dynamic and open-ended nature of landscape architecture can provide meaningful lessons for a 'weak' or 'fragile' architecture that acknowledges vulnerability instead of obsessively fighting against time and change as architecture traditionally has done." I was struck by reading some theory applied to American context and designers. 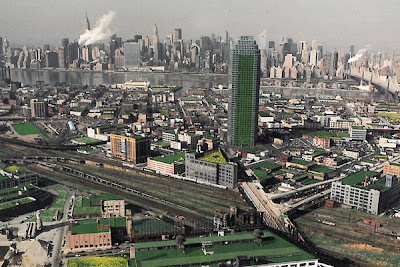 Grahame Shane's 'Recombinant Landscapes in the American City' (p.24) investigates "...the approaches to landscape that have been emerging since the mid-20th century and are set to recombine urban assemblages whether they are located in historic city centres, postindustrial waterfronts or suburban sprawl." 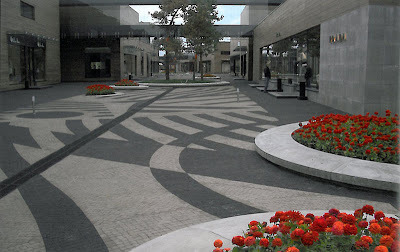 There is also a well documented study of US design featuring state-side landscape professionals. 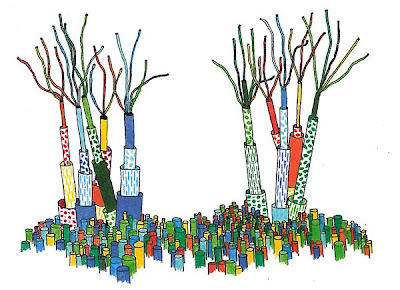 In 'Urban American Landscape', Jayne Merkel (p.36) covers a range of home-grown professionals, including Balmori Associates, Ken Smith, Field Operations, Patricia Johanson, Michael Van Valkenburgh, and Margie Ruddick/WRT. And no self-respecting theory magazine would be complete without some densely packed informational diagrams that would make Edward Tufte proud. In this case, a graphic for a piece entitled 'Operationalising Patch Dynamics' by Victoria Marshall and Brian McGrath (p.52). 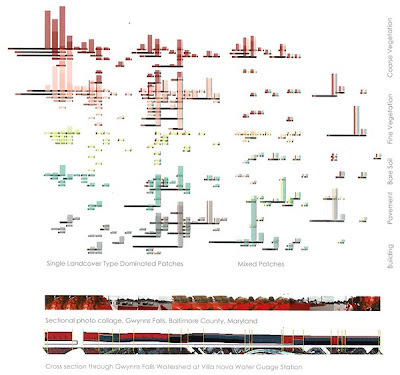 The graphic is a classification of "...the physical structure of land-cover patches in Baltimore's Gwynns Falls Watershed... based on possible combinations of different percentages of five land-cover types. The numerical prevalence of patch classes results in a distinctive signature." This type of graphic is more common as we are challenged to show temporal change and relationships between multiple dynamic systems simultaneously. While interesting visually, the translation of these dense graphics into designs is something that is still difficult to ascertain. An essay regarding the 'Toronto Waterfront Revitalisation' (p.48) along with a number of later essays, gives some real application to theory in new ways. While encompassing some interesting subject matter, the later essays tended to be less interesting due to their focus on the over-exposed (New Orleans) and the overly dense (techno-informational space making). The AD+ section was even less interesting, enough that I may have skipped most of it. 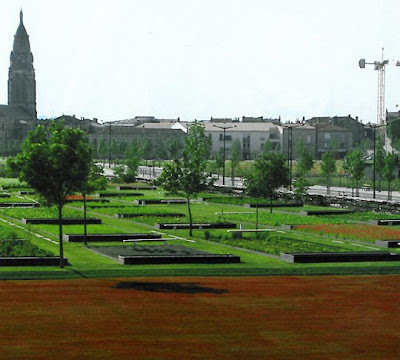 The strongest element of 'Site/Non-Site' was a focused view across the pond, entitled ''Activating Nature': The Magical Realism of Contemporary Landscape Architecture in Europe'. The essay by Lucy Bullivant (p.76)features the likes of West 8, Gross.Max, and Mosbach Paysagistes, and how they are: "...leading the way with their highly dynamic and inventive narrative approaches to history, culture and the emergent city." 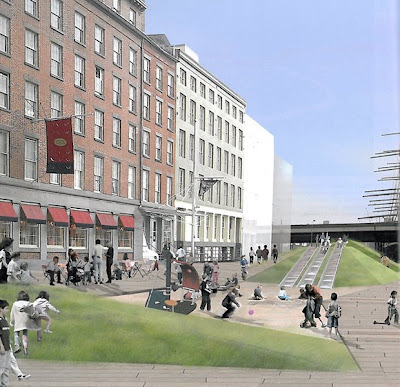 The work of these three firms speaks for itself for the most part, and is backed up with an essay that provides some of the cultural differences as to the approach of European vs. North American landscape architects. Some have to due with some conservatism of the design community, others with the contextual differences between America with it's relative youth and the dense history of European countries. 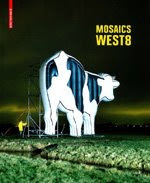 On that note, another recent addition to my library, and an economical one at that, was the alternative hardcover version of 'Mosaics - West 8' published by Birkhauser. An alternative cover that the previous edition I've seen previously, but a bargain at 25 bucks brand new for the hardcover version and oh, so worth it - with a lot of imagery I had yet to see. More to come on this one - and I think... it's no longer available at cheap pricing.